Welcome, or welcome back Tigers, to another year at Towson. If you are new to campus, you might be wondering how you are going to assimilate into this new world of college and campus life. 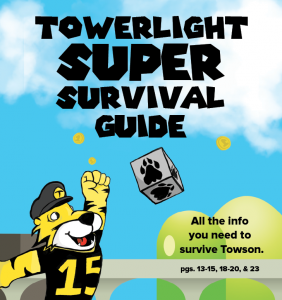 But never fear, The Towerlight is here to give you all of the information you need to make your first semester go as smoothly as if you had planned it that way. In this Super Survival Guide you will find a list of mistakes you should try not to make during your Freshman semester, as well as an article on how to literally survive on campus with information about where you can go for help with campus safety, personal health, or academic problems. You can also find, in honor of Towson University’s 150th anniversary, a list of 150 reasons why TU is the best. Lastly, a compilation of stories about Towson-related events and activities that took place during the summer break is available to you so that you can stay up to date on campus and community happenings. We hope this guide is helpful to you, and makes you feel just a little more welcomed to campus this semester. College is hard. Not just academically, but socially and personally as well. We at The Towerlight understand this, and sympathize with you first year students (freshmen), who have only just embarked on a long and winding four-ish year journey that will most likely transform you into an entirely different person by the time you don your graduation cap and gown. That’s why we have compiled this list of 30 mistakes you should try not to make during your freshman year here at Towson. 1. Wearing the free Towson lanyard you get with your new OneCard. If you do, everyone will know you are a freshman. 2. Not getting involved. Join a club or a group because you’ll make friends and have something that makes your experience unique. 3. “Sexiling” your roommate, it won’t be so fun when it happens to you. 4. Getting caught drinking on campus. It’s just not worth it guys. 5. Losing a textbook you rented. 6. Sleeping through your final exam. 7. Not paying attention to campus life. There is a lot that happens at Towson, you never have to be bored. 8. Not paying attention in class. Taking notes really isn’t so bad, and it’s especially helpful when exam time rolls around. 9. Stressing over every single grade. Sometimes, it’s okay to take the zero. 10. Pass/fail is also an acceptable option for those not so critical classes. 11. Not bothering to find Patuxent Bistro (Ptux.) Pro tip: University Union. Second floor. 13. Leaving your cellphone or laptop charger in your room because you think you won’t need it. You will. 14. Not snagging that sweet seat in the back row when you had the chance. 15. Not saving all of your important projects in at least two different places. Don’t let a computer glitch or loose cord cost you hours of work. 16. Thinking all the free stuff will be gone by the time you get there – it won’t be. 17. Hooking up with a floormate. You still have to see them almost every day for the rest of the year, and it can make a short and awkward elevator ride feel like it’s taking a millennium. 18. Getting Hawkins Hall and the Psychology Building confused. They are connected so sometimes it does get a little confusing, but just pay attention to the signs and you won’t end up in the wrong room the first day of class. 19. Throwing away any extra meals you may have at the end of the week. No way any of your friends turns down lunch if you’re treating. 20. Thinking dropping a class is somehow taboo. It’s not. Just make sure you do it in time to get some of your money back. 21. Not taking advantage of study groups. They’re great for learning, laughing and making friends along the way. 22. Not talking to professors during their office hours. 23. Burning through a class’ excused absences. And then getting the flu. 24. Thinking 8 a.m. classes are the worst. The early bird gets the worm and, if they’re commuting, their choice of parking spaces. 25. Going home every weekend. Force yourself to stay and meet new people you will be glad you did later. 26. Not going to campus events. You can meet new people and maybe get some free stuff. 27. Being an inconsiderate roommate. Aretha Franklin had it right: R-E-S-P-E-C-T, guys. 28. Being afriad to embarrass yourself. 29. Letting yourself get out of shape. There is a beautiful and soon to be renovated gym right on campus for you to use. 30. Not stepping out of your confort zone. It’s what college is for after all. What good would a survival guide be if we didn’t teach you a few things about how to actually survive on Towson’s campus? In an effort to help anyone who’s new to campus – or may need a reminder about what’s what – we’ve compiled some information here. TUPD is a fully-staffed police department, capable of making arrests and helping other jurisdictions, like the Baltimore County Police, with investigations. The emergency phone number for TUPD is 410-704-4444. Activating a Blue Light around campus will also call TUPD. As a member of the Towson University community, you can also register for text message alerts. The Health Center is located in the newly-opened building across the street from the College of Liberal Arts, and next to Residence Tower. The Health Center offers a variety of services for students, including clinic hours, from 8:30 a.m. to 4:30 p.m. Appointments can be made online, through the TigerHealth portal. Some “simple” ailments, like a sprained ankle, pink eye or a sore throat, to name a few, can be seen on a same-day basis, as a part of the Fast Track Clinic. Students visiting the Health Center should be sure to bring their OneCard and their insurance card. Students can also call the Nurse Advice Line at 410-704-2466 after clinic hours. In the same building as the Health Center, the Counseling Center offers services to help students with their emotional and psychological health. Students can make an appointment to talk to a counselor about concerns they may have by speaking with someone at the front desk, or by calling 410-704-2512. For most services, there is no fee. In addition to individual services and initial visits, the Counseling Center offers several counseling groups, some that are on a drop-in basis. During regular business hours (Monday-Friday, 8 a.m. to 5 p.m.), the Counseling Center is able to help students who are in crisis. Outside of those times, the center recommends a few courses of action. If someone’s health or safety is at risk, call 911. TUPD can contact Counseling Center staff as needed in an emergency. Anyone in suicidal crisis can call the National Suicide Prevention Hotline at 800-273-8255. Towson University expects students to call for help, remain with the student who needs assistance, and then cooperate with university officials following the incident. Because of the importance that is placed on student health and safety, students who comply with the protocol may have fines and university probations waived. Students who complete the educational sanction after an incident will have the incident marked as “for information only” and it will not be a part of the student’s disciplinary record. In addition to keeping tigers healthy and happy, Towson offers a number of services to keep students successful in their professional lives. The advising center (410-704-2472) is located in the Lecture Hall building, above Freedom Square. They’re responsible for coordinating the First-Year Experience (FYE) program that all freshmen go through. The Academic Advising Center also has professional advisors on staff to help students ensure access to academic advising to meet individual needs and interests. The Academic Achievement Center (410-704-2291) is located on the fifth floor of Cook Library. They provide tutoring, peer-assisted learning programs, academic coaching and study groups, to name a few of their services. The Career Center (410-704-2233) is located in the 7800 York Road Building, on the second floor, in suite 206. The Career Center hosts a variety of services to help students achieve career goals, including resume and cover letter reviews, mock interviews and job and internship searches. The Career Center can also help with developing career action plans and helping students narrow exploring careers and majors. The Writing Center (410-704-3426) is located on the fifth floor of the College of Liberal Arts, in suite 5330. The Writing Center works with not only undergraduate students, but graduate students, faculty and staff — at any point in the writing process, be it brainstorming, polishing a final draft, or any point in between. The Writing Center isn’t necessarily a group of editors, but of peer writing assistants who will help clients to sharpen ideas, communicate thoughts more clearly and organize their thoughts. Writing assistants come from a variety of disciplines and majors, so that any writing need of a student can be met. The Writing Center does take walk-ins, but during busier times of the semester, like midterms and finals, appointments tend to fill up quickly. Those interested in booking an appointment can call or stop by the front desk. 1. We have four tiger statues on campus. 2. We’re minutes from the beautiful and bustling city of Baltimore. 3. The Towson community’s annual Towsontown Spring Festival combines the joys of music, beer gardens, local vendors and fried food – and is only a ten-minute walk from campus. 4. The Glen Arboretum is a living, 12-acre museum right on campus – and, sometimes, goats hang out in it. 5. In fact, the 328-acre campus has several beautiful outdoor areas for students to explore. 6. The Glen Arboretum, sometimes also called The Glen Woods, even has a barbeque pit, a Challenge Course obstacle operated by Campus Recreation, and a pavilion. 7. The College of Health Professions has more bachelor’s and master’s healthcare and sport-related students enrolled in its program than any other institution in the state. 8. There are some incredible internship opportunities in this area, for students looking into any career path. 9. We have Maryland’s only combined B.S./M.S. program in Occupational Therapy. 10. Despite a lot of recent controversy, we have a kickass, nationally-ranked debate team. 11. We are Maryland’s largest producer of teachers. 12. In fact our College of Education is the largest and oldest in the state. 13. When Towson started, it was exclusively as a teacher’s college. 14. It was a pair of Towson students that led a massive protest through Baltimore following the death of Freddie Gray in the spring. 15. We have an independent, student-run newspaper that can bring you news without much pressure from administration. 16. And, for the more creative, there’s Grub Street, an annual student-created literary magazine. 17. We have over 22,000 students enrolled here. 18. Sometimes, if the line isn’t too long, you can successfully get Starbucks in the library. 19. Sometimes, if you’re really lucky, there will be free coffee and donuts from the SGA or some student group in the library. 21. Towson Hot Bagels, Fractured Prune and so much more, all within walking distance of campus. 22. To reiterate – OrderUp, which will bring delicious food to your dorm building. 23. Once more – Towson Hot Bagels, the mother of all breakfast food, can be delivered to your door with OrderUp. 24. Speaking of Towson Hot Bagels, THB is definitely the best place to go for a hangover. 25. You can get spaghetti pizza at the Pasta Mista near the mall. Spaghetti. Pizza. 26. Our Health Center offers massages at a competitive price. 27. The Counseling Center offers reliable and responsive help for students. 28. Sometimes – well, frequently – you can spot a handful of cats wandering around campus. 29. On that note, sometimes puppies show up to take the edge off finals week stress. 30. The squirrels here are also plentiful and fearless when it comes to getting close to students. 31. Survive Towson: Every year students gather on campus in their best camo-wear to chase one another across campus in preparation for the inevitable zombie apocalypse. 32. We have an incredible Center for Student Diversity, that helps students from all backgrounds and of all identities find their places on campus. 33. When it rains, the downhill half of campus turns into a giant waterslide. Which is fun and also scary. Tread carefully, Tigers. 34. As a result, galoshes are always in style here. 35. When it snows, the hill outside Smith Hall is great for sledding. 36. Upward of 3,000 undergrad students helped to dictate campus leadership by voting in the last SGA election. 37. Cook Library is an amazing resource for print and digital collections – and, it’s a staple during finals week since it’s open 24/7 for almost 10 days. 38. Tigerfest: Towson’s annual spring concert and all-day party event where freshmen come out to see that year’s chosen performer, seniors head to the bars to avoid the freshmen, and sophomores and juniors remain indoors with their faces buried in books. 39. Traditionally Tigerfest was a one day event held outside in Johnny Unitas stadium, but the last two years the event has been expanded to two-days and moved into SECU Arena. 40. In the past, Tigerfest has drawn big name performers like G-Eazy, Krewella, Steve Aoki, Juicy J, Kid Cudi, Reel Big Fish, and more. 41. If Tigerfest seems too far away, don’t fret – Towson also has a pretty big homecoming concert in the fall. 42. TU’s Career Center is constantly holding job fairs, resume workshops, mock interviews and other events to help students prepare for life after college. 43. Every now and then, the Career Center will host an event where you’ll be able to get a free, professional headshot to spruce up your LinkedIn profile. 44. The chalkboards in Freedom Square often depict beautiful student artwork, thoughtful comments about social justice, or just plain stupid, funny jokes. 45. “The beach,” located outside of the library, is a great place to hang out with friends or relax with a cup of coffee and read a book. 46. There are many religious and spiritual student organizations available to students. 47. There are several silent study locations on campus – one in Cook Library and another in a beautiful glass room on the 4th floor of the CLA. 48. We have a pretty great student run radio station, XTSR. 49. Our Dance Team won their 17th consecutive National Championship this past April. 50. There are also a number of club dance teams and a POMS team. 51. Au Bon ‘bring the’ Pain is, surprisingly, really good for campus food. 52. The school has held four different names over the years, The State Normal School, State Teachers College at Towson, Towson State College, Towson State University, and finally Towson University in 1997. 53. Brian Stelter went to school here. 54. Amy Schumer went to school here. 55. Mike Rowe went to school here. 56. Actually, a lot of famous individuals have attended Towson. 57. In 2010, we were the first four-year institution in Maryland to switch to a smoke-free campus. 58. For 30 consecutive years the Towson University Police Department has been awarded the Governor’s Award for Crime Prevention, this is more than any other high education institution in Maryland. 59. In 2013 the Towson football team played in the FCS National Championship game for the first time in program history. 61. We have a new Cross Country head coach, Mike Jackson. 62. Burdick Hall just began a 94,000 square foot expansion to be completed in 2017. 63. Last year Towson’s women’s soccer team made it to the CAA Tournament for the first time in the program’s history. 64. We have a planetarium on campus, allowing students to view stars at any time of the day or night. 65. The Watson-King Planetarium hosts presentations on the third Friday of every month during the academic year. 66. We were Maryland’s first training school for teachers. 67. Doc the Tiger is both a fearsome mascot and a loveable giant who gives out hugs around Valentine’s Day. 68. The Towerlight hosts a Towson’s Most Eligible contest every Valentine’s Day — it’s a great way to find your perfect date. 69. Towson was first built in Baltimore, and relocated several times before settling in Towson. 70. After the final move, the ‘new’ Towson campus opened in September 1915 and was comprised of Stephens Hall, Newell Hall, and the power plant. 71. Glen Esk was constructed in 1903, making it 112 years old this year, and originally served as the home for the school’s Principal. 72. In 1921 the school’s first newspaper, The Oriole, was published. 73. Skydiving club is a thing here. 74. Hiking club is a thing here. 75. Towson provides students with the option of living on alcohol-free floors. 76. All students were issued fancy new OneCards this semester that have the ability to be synched with a PNC bank account. 78. There is a free, daily, off-campus shuttle service that students can use to get from their apartments or homes to campus so they don’t have to deal with parking everyday. 79. The shuttles run on-campus, too. They’ll get you from one side of campus to the other even if it’s really early in the morning and walking to Stephens Hall is just not happening. 80. Environmental sustainability is a primary focus on Towson’s campus. 81. Towson has a yearly program, Envirofest, which draws student focus to the environment. 82. Towson recently started using compostable utensils in its dining halls. 83. We have the most comprehensive sports program in the metropolitan Baltimore Area. 84. Towson boasts 19 NCAA Division I varsity teams, which compete in the Colonial Athletic Association. 85. The Tigers have won CAA league titles in football, baseball, men’s and women’s lacrosse, women’s swimming, men’s soccer and men’s golf since joining in 2001. 86. There have been eight CAA championship teams at Towson in the last three seasons alone – football, men’s lacrosse, baseball, women’s swimming and diving twice, and women’s lacrosse three times. 87. Our football stadium, Johnny Unitas, is the metro area’s third-largest outdoor stadium with 11,000 seats. 88. We have an entirely student-run theatre company, Actors Anonymous. 89. Our new SECU Arena, which opened in Fall 2013, seats 5,200 individuals. 90. In 2012 former president Maravene Loeschke created the International Walkway, which features flags from the home countries of Towson students and lines the walkway between the CLA and the Psychology Building. 91. We have a wonderful Interim President, Dr. Timothy Chandler, who was previously Towson’s Provost. 92. Towson has an active Student Government Association that acts as a voice for the undergraduate student body. 93. We have an Optimist Club, which is pretty positive. 94. The Campus Activities Board (CAB) is responsible for much of the plentiful and terrific campus and community events open for students to participate in. 95. Dining halls provide Halal, Kosher, and vegetarian options for students on campus. 96. There is a Dunkin’ Doughnuts within walking distance from campus. 97. There is also a Starbucks immediately outside of campus off of York Road, for when the one on-campus is too busy. 98. House of Cards filmed in the Liberal Arts building over the summer. 99. House of Cards filmed in the Institute for Well-Being before that. 100. They say the word “Towson” in House of Cards Season 3 at least twice. 101. VEEP filmed in the Auburn House, but it was kept hush-hush. 102. There are a number of apartment complexes to choose from when moving off-campus. 103. There are high quality dorms in West Village, and apartments for upperclassmen. 104. There are new residence halls being built out in West Village. 105. There are over 200 student organizations to sample and get involved in. 106. The Tiger Pledge has students promise to Treat others with civility and respect, Inspire others with leadership and excellent, Grow personally, professionally, ethically, and intellectually, Engage in my community to make a difference, and Represent Towson University proudly. 107. This year Towson received the Community Engagement Classification from the Carnegie Foundation for the Advancement of Teaching. 108. Students, faculty, and staff are given access to The Baltimore Sun, USA Today, and The New York Times through the Collegiate Readership Program. 109. They also host New York Times Talk Lunches twice a month. 110. Navigating through campus via footpaths free of roads and traffic give Towson students a community feel while making their way to class. 111. Pizans at 3 a.m. is the closest thing to pure joy. 112. The beautiful architecture and landscaping. The detailing is pretty impressive if you stop to notice. 113. A tiger is easily the most badass college mascot in Maryland. 114. Everything is within walking distance, all the more reason to spend time outside. 115. We have a Chick-fil-a in our Susquehanna Dining Hall. Waffle fries are the perfect way to unwind after class. 116. There is a lot to explore within walking and driving distance in uptown Towson, if you ever need a change of scene. 117. The band All Time Low is from Towson, so that’s cool. 118. Our theatre department presents professional-level shows multiple times a semester. 119. Our dance department does this as well. 120. Campus is really close to the Towson Town Center, a huge mall where you can find anything you’re looking for. 121. You can spend many days exploring the Towson Town Center and still not hit up every single store. 122. The Baltimore Orioles offers discounted tickets for students every Friday night home game, you can see a professional baseball game for less than a dinner and a movie! 123. Our location near Baltimore means there are many opportunities for professional jobs after graduation. 125. Burdick Field is beautiful and the perfect place to host a pick-up soccer match. 126. TU’s WEPA printing system means that if you forgot to print your report before class. 127. Towson’s writing center will help you make your final essay A+ worthy. 128. We have some awesome administrators. 135. And way too many others — if we tried to list them all, it would take the entire issue. 136. Towson’s photographer, Kanji, is the absolute best at what he does. 137. When the weather is nice and sunny, Towson is absolutely beautiful. 138. There are some incredible professors in every single department on campus. 139. The Towerlight also has its own General Manager, Mike, who has aided the staff of The Towerlight on a daily basis for an unknown amount of time. We may never uncover all of your mysteries Mike, but at least we know when your birthday is. 140. Our professors are a great source for all sorts of potential internship or job connections. 141. There’s a brand new Cinemark movie theater right up the street. 142. The Cinemark offers a reduced student price when you show your ID. 143. So do some other local places. The Noodles and Company on Goucher will give you a free drink if you have it. 144. Actually, a lot of places will offer some really cool stuff if you show your student ID. It never hurts to ask. 145. Near the Cinemark are some really incredible places to grab a bite to eat, including BJ’s Brewhouse, Bobby’s Burger Palace, Pollo Amigo, and On The Border (which has really good margaritas). 146. If you’re in West Village, the fourth and fifth floors of the West Village Commons make excellent spaces to study. 147. Newell Dining Hall has some great options, every single day. 148. The teachers here are working professionals; you may find them being your coworkers! 149. There’s literally so much going on here! 150. We were founded in 1866 in Baltimore as the State Normal School, making Towson University 150 years old this upcoming year, 2016. In order to ‘survive’ the start of the school year, you’ll need to be up to date on all of the Towson news, arts and life and sports stories that developed and began over the summer. Here are a few compiled for you by our staff to keep you in the loop. 1. Former TU professor Barry Freundel was sentenced to six and a half years in prison at his sentencing trial in May – 45 days for each of the 52 victims of his voyeurism within the allotted timeframe. Freundel pleaded guilty in February to secretly recording women as they prepared for a mikvah, a bath used as part of a Jewish purification ritual. In February, Freundel resigned his position at Towson University, but his resignation would not take effect for 30 days. Per University System of Maryland policy, when he was first charged, Freundel was put on paid leave. During his leave, he collected over $30,000 in salary. In late July, Freundel appealed to reduce his prison time. A D.C. Superior Court Judge, however, denied the appeal. 2. In early July, Laurie Mullen replaced Raymond Lorion as dean of TU’s College of Education. Prior to her move to TU, Mullen acted as the associate dean of Ball State University’s Teachers College. Lorion, who worked as dean of the College of Education for 11 years, will remain with TU as he further develops and expands the Center for Applications and Innovation Research in Education, or CAIRE, which he created. 3. On June 24, University System of Maryland Student Council President Kennard A. Wallace, then president-elect, released a statement calling for a ban of the Confederate Flag on all USM campuses. Wallace’s statement came just days after the June 17th shooting at Emanuel African Methodist Episcopal Church in Charleston, South Carolina, that left nine people dead. “If we are to truly make impactful strides in acceptance, inclusiveness and diversity, we must also take a firm stand against the thinly-veiled agents of prejudice that still exist in our society,” Wallace said in his statement. He referenced the three years he spent as a Resident Assistant at Towson, where he graduated with a degree in political science. In a statement dated June 25, TU University Residence Government President Jon Connelly announced the URG Executive Board’s support of Wallace’s initiative. “As President, I will ensure that URG does everything that it can to see this ban enacted,” Connelly said. According to Connelly’s statement, at time of writing he had reached out to try to gain the support of other Maryland Residence Hall Associations and planned to raise the issue again when classes resumed in the fall. “I am under no illusions that this ban will solve racism or intolerance on our campus, or any campus in Maryland. This must be but one act in the larger struggle for racial equality and acceptance,” he said. When it was posted on Facebook, the URG statement drew mixed opinions from viewers. The Towerlight will continue to cover this story as information becomes available. 1. Theta Chi was recognized for many awards this summer, including the Phil S. Randall recruitment award, Sacred Purpose award and the Howard R. Alter Award. 2. Notable Towson alum Amy Schumer debuted her new movie “Trainwreck” featuring Bill Hader on July 17. Schumer last visited Towson University in March 2014 for a stand-up comedy event, so hopefully her Hollywood success will remind her to return to her alma mater soon. 3. Junior graphic design major Terrance Diggs teamed up with a High Point University student to develop an app called “Album Pop” that helps users create their own custom album covers by uploading a photo, choosing a filter and adding custom text. The app is available for free on the Apple App Store and has already reached over 5,000 downloads since its launch in March. 4. Two Towson students, Rosemary Meister and Nia Nyamweya, began a project to raise $10,000 for The Asylee Women’s Enterprise, a Towson-based program that helps women seeking asylum in the United States. After professors Sara Gunning and Zosha Stuckey assigned this project in their grant-writing class, Nyamweya and Meister teamed up to help the cause. Nyamweya found the inspiration to help this fund through her internship and volunteering with AWE. 1. Head Coach Rob Ambrose announced Saturday, March 28 that quarterback Kevin Olsen, the younger brother of Carolina Panthers tight end Greg Olsen, was dismissed from the program for a violation of team rules and is no longer enrolled at the school. Olsen, a once top-100 prospect announced he was transferring to Towson in December after leaving the University of Miami in September. In his time with the Hurricanes, Olsen was suspended three times over the course of two seasons and was also in trouble with the law. In May of 2013, Olsen was charged with leaving the scene of an accident, failing to report an accident and careless driving. On Sept. 15 of last year, he was charged with driving under the influence and possession of a fake driver’s license. With the departure of Olsen, there is now an open competition for the quarterback position for the Tigers. Their season will kick off on Saturday, Sept. 5 in Greenville, North Carolina, against the East Carolina Pirates. 2. NBA guard and Towson University alumni Gary Neal signed a one-year, $2.1 million deal with the Washington Wizards this offseason. Neal, a 30-year-old veteran from Baltimore joined the Tigers in 2005 after transferring from La Salle University in 2004. In his first year with Towson, Neal played in 17 games and averaged 26.1 points, 3.9 rebounds and 2.9 assists per game. In his final year with the Tigers, Neal played in all 32 games and averaged 25.3 points, 4.2 rebounds and 3.5 assists per game. Neal will look to make a difference for the Wizards this season as the team narrowly missed the Eastern Conference Finals after losing to the Atlanta Hawks in the Eastern Conference semi-finals. In his NBA career, Neal has played with four different teams and has averaged 9.9 points, 2.2 rebounds and 1.7 assists per game. 3. Former Towson University lacrosse player Justin Berry is one of four athletes who will be inducted into the Towson University Athletics Hall of Fame this fall. In 2001, Berry was the captain of the Tiger men’s lacrosse team that made it to the NCAA Final Four. He was also named All-American East in 2001 and All-American in 2002. Berry is currently the Tigers all-time, faceoff wins leader with 460 wins, and ranks 11th all-time in NCAA History with 62 percent of faceoffs won. Berry also holds the Tigers single-season ground ball record with 147, and is currently fourth all-time at Towson with 252 ground balls. After a successful career with the Tigers, Berry was named “the best faceoff man in college lacrosse” by Inside Lacrosse magazine, and was drafted by the New Jersey Pride of Major League Lacrosse. Berry also played for the MLL’s Los Angeles Riptide before retiring. 4. Assistant Athletic Director for the Total Tiger Program, Antwaine Smith, announced this summer that Mike Jackson will be the new Head Coach of the Cross Country and Track and Field team. For the last 11 years, Jackson has coached the Cross Country and Track and Field team at Ramapo College in Mahwah, New Jersey. In Jackson’s time at Ramapo College, the program saw five individual NCAA championships, and 74 NCAA Championship Meet participants in both cross country and track and field. Jackson also helped Ramapo College earn a third-place tie at the 2013 NCAA Division III Outdoor Track and Field Championship. Over his career, Jackson has been a United States Track and Field and Cross Country Coaches Association (USTFCCCA) Atlantic Region Women’s Head Coach of the Year twice, and was named the New Jersey Athletic Conference Coach of the Year seven times. Jackson will become the fourth Head Coach in women’s cross country program history, and the third Head Coach in women’s track and field program history at Towson. – Compiled by The Towerlight staff.